In the dream story of a land of four rivers, which may be deemed the rivers of our life, we find gates with gate keepers along the way to protect the lands beyond, and to protect also the travelers from the demands of these lands for higher levels of achievements in living that are demands measured in growing up in the grace of our humanity. The story of the dialog is fiction of course. It is situated in a dream in Venezuela in the background of an emergency conference to rescue the world. Sometimes our dinner conversations were on subjects that demanded the deepest possible thought, and sometimes the subjects were met with a science fiction type approach that bordered on tall dreaming about a world that was still being build. At times it was also centered on actual dreams. Caracas had been a wonderful place for dreaming. I don't know whether this dreaming was caused by the thin mountain air, or the fact that our hotel was often surrounded by clouds during the night, or whether it was due to the total quietness of sleeping high above the city on a mountain ridge, cradled on scientifically advanced mattresses, as the hotel boasted in its advertisements. Often, elaborate fantasies emerged in my dreams, sometimes with a clarity that was more forceful than a movie or a stage play. The majority of my dreams, of course, were directly connected with the conference, and some were centered on Antonovna. 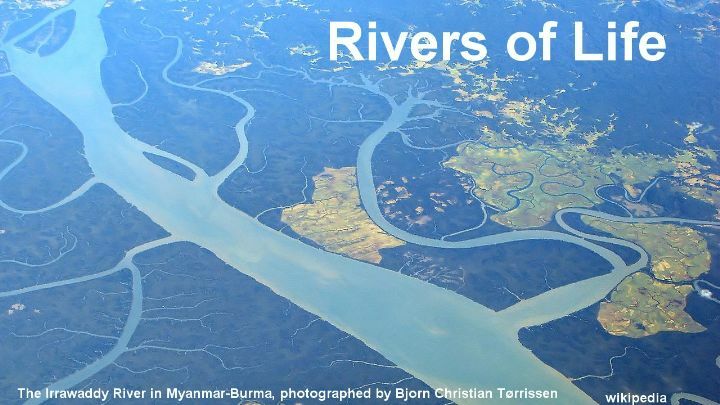 The video presents Chapter 7 - Rivers of Life.